The Econet LTE that we wrote about and discussed in our previous podcast, after the operator had finally opened up the service to mobile phones (it used to be accessed through a modem only) has now taken full flight – from a promotional standpoint at least. Not only has Econet been making a fair amount of noise about the faster network, sharing how-tos on activating it and important information on compatible devices, it has also extended free broadband as part of an LTE. Subscribers are being encouraged to test the service and everyone who signs up to the LTE Test drive is receiving 300 MB of free data which is valid for 3 days. It’s great market entry strategy, considering that most subscribers would have been stuck on 3G if they weren’t given a feel of how fast LTE can be compared to 3G speeds. And so far, it seems to be working well. The responses from subscribers on the Econet Facebook page indicate a warm reception for the service, with a lot of applause for the broadband freebie. In the 4G race, Econet is going up against NetOne, which has been very aggressive with its LTE network expansion. NetOne has a wider nationwide coverage in terms of LTE, with a presence in every province through 45 active base stations and another 15 set for activation in the short term. This total doesn’t account for more work being carried out in its nationwide LTE network and service upgrade. 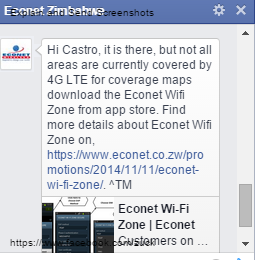 Econet hasn’t been ignoring LTE coverage, though. The operator has extended its LTE footprint and according to information we received from sources at Econet, the LTE base stations total in Harare has increased to about 20, exceeding NetOne’s total. Econet has maintained 5 base stations in Bulawayo and it’s still got its initial placement in Vitoria Falls. 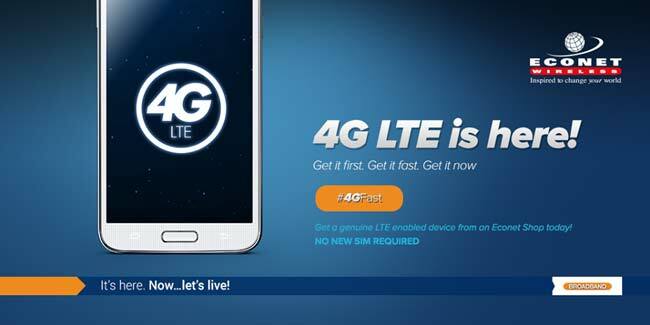 Econet has been taking a shot at at NetOne through its advertising, though, running with the tag, “No New SIM required”, which one-ups NetOne and its new LTE SIM requirements. Let’s just hope the two networks compete on broadband price and network availability as well. About that sim that you received from Net*One! Whats the story. Secondly how do we sign up for LTE? Oh and what phones is Econet offering for 4G and at what price? Interesting times indeed if the two operators are going toe to toe. Let’s hope the competition leads to quality service and ultimate customer satisfaction. We are still waiting for that Lte speed test which you promised us. The number of times I have opened this page looking for that info is now ridiculous. Maybe more educative fliers on this 4G Lte will help people understand better. The cellular data connection icons and types of connections they represent can vary by mobile operator. The 4G icon icon may be used for a variety of cellular data connections—including LTE and HSPA+. For an LTE connection, you might see an LTE icon icon instead of an LTE icon or 4G icon icon. I see, this may have had more to do with death of the dream bundles than I realised! 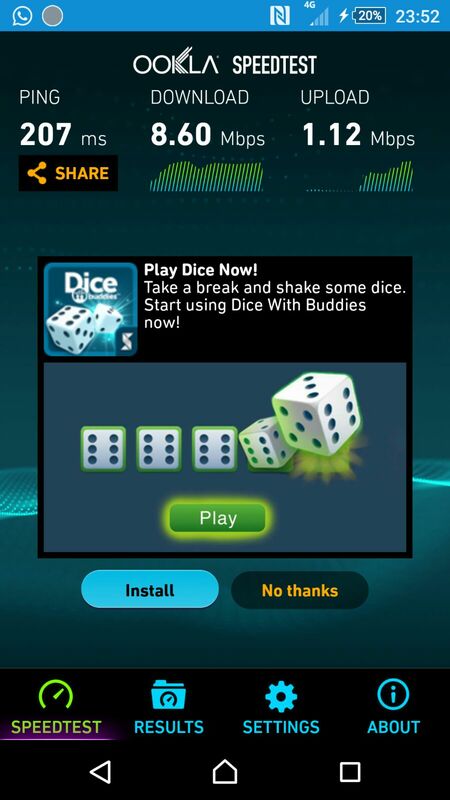 With speeds like this, people would have a real chance of using up that 3gb in a useful time frame! lol, you’ve brought me down to earth! But it’s funny how those speeds never really translated to a good browsing experience for me, even with my phone tethered to a pc. The banner plane flew over our office this morning, they really are throwing money at this. However, my misfortune in being suckered into getting the Ace 3 Duos over the Ace 3 lte has come back to bite me. Is the ace still the cheapest (brand new) lte phone around? No. I just eneable the LTE but no realization of a change in speed. And where is my 300MB of data? Have searched wide and high in Byo.. Nothing like that exists!!!! #sad…. If you live in Harare, you seem to have a steady Internet connection, as soon as you drive out of Harare, you can say goodbye! I have complained to deaf ears for over 2 years now about the internet connection in KweKwe…. Can you rather invest in upgrading your system so there is less congestion.